E.S.C. 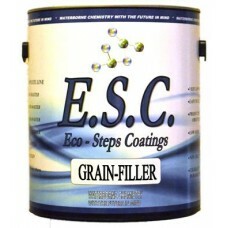 Coatings Grain-Filler is a water-based grain filler used to fill the grain lines which occur ..
E.S.C. Coatings Grain-Filler is a water-based grain filler used to fill the grain lines which occur in many species of wood and prevent a “smooth” look or feel to the finish. The product can be used clear or tinted with small amounts of E.S.C. stains or dyes or most water based colorants. When tinting a small amount of color goes a long way. Remember to tint to the final color of the finished piece and not the color of the raw wood. A unique look can be achieved however by tinting the grain filler dark and staining the wood light. As with any grain filler proper application is key. Be sure to sand all the grain filler away from the surface so only small amounts are left in the deep grain. If proper sanding is not done the stain will have a difficult time penetrating and will not take uniformly. Application: E.S.C. Coatings Grain-Filler should be applied by a squeegee type application forcing the grain filler into the pores by dragging it at a 45 degree angle to the grain while removing the excess material from the surface. Allow 45-75 minutes to dry depending on the depth of the fill. After dry a complete sanding of the surface is necessary to remove all surface grain filler. The only grain filler left behind should be in the deep pores of the wood. On certain very open-grained wood a second application may be required to get that “full fill”. Dry Time: E.S.C. Coatings Grain-Filler is designed to dry to sand at 75 F in less than 1 hour. Re-coat immediately after sanding. It is safest to apply no more than 2 coats per day. Product must be completely dry before another coat is applied. Clean-Up: Clean and flush all equipment with water immediately after use.